Art by Vince Colletta Studio from the story “Man Hater” in FIRST KISS #18, 1961. 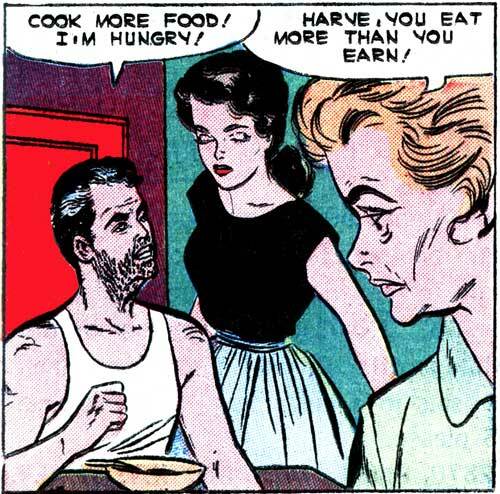 After being fired as a restaurant critic for Snobbish Living Magazine, “Dapper Harve Hillobeans” relaxed his standards—and his waistline—considerably. Not quite. But he’s close. Ironically, he was fired for describing every single restaurant dish as “food”, as in “The food was good” or “They didn’t pile enough food on my plate”.